William and Mary. 1689-1694. AR crown. 29.66 gm. 38 mm. 1692 QVARTO. 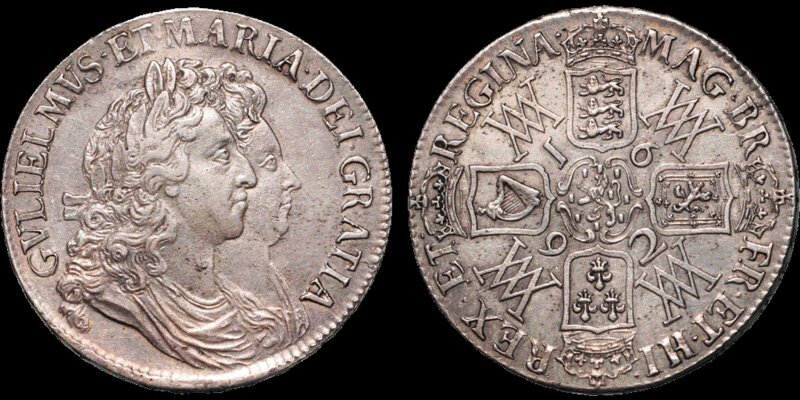 Their conjoined busts right; GVLIELMVS ET MARIA DEI GRATIA around / Crowned cruciform arms, WM monogram in angles, date around center with a lion rampant; MAG BR FR ET HI REX ET REGINA. S. 3433. Bull 822 (ESC 83). Near Extremely Fine; well struck with slight weakness in high point of curls on William; fresh surfaces, unusually free of of haymarking, with substantial iridescence; lightly toned with roseate highlights.